The latest products feed contains the latest 10 products added to Pete's Bargain Centre. 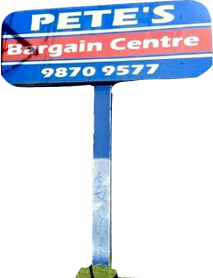 The featured products feed contains the latest 10 featured products on Pete's Bargain Centre. To create a product search feed, perform a standard search on Pete's Bargain Centre and at the bottom of the page click on one of the syndication options.